On September 16, 2017, at the Ninth International Symposium in Memory of Raisa Gorbachev on the Topic “Hematopoietic Stem Cell Transplantation: Gene and Cell Therapies,” the Imperial Cancer Foundation Presented its Prizes to Three Young Cancer Researchers. 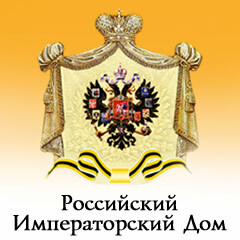 Members of the Board of Experts for the Foundation’s Prizes this year included: Iurii Alexandrovich Punanov, Chief Pediatric Oncologist in St. Petersburg, and Professor in the Department of Hematology, Transfusion Medicine, and Transplantation at the First Pavlov State Medical University of St. Petersburg; Professor Boris Vladimirovich Afanasiev, Distinguished Physician of the Russian Federation and Director of the Raisa Gorbachev Institute for Pediatric Hematology and Transplantation; Professor Georgii Moiseevich Manikhas, Distinguished Physician of the Russian Federation, Academician of the Russian Academy of Natural Sciences, and Chief Medical Officer of the City Clinical Oncology Center; and Dr. Svetlana Alexandrovna Safronova, Chief Pediatric Oncologist in the Leningrad Region and an oncologist at the Children’s Hospice in St. Petersburg. The Board of Experts identified three young doctors who have made a significant contribution to Russian medicine in the field of oncology: Tatiana Bykova, Polina Kozhokar, and Pavel Borisov. 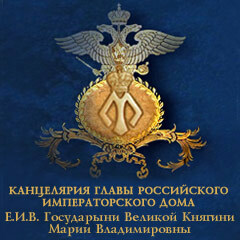 Dr. Tatiana Alexandrovna Bykova received the Foundation’s Prize in the First Class, along with a monetary award of 60,000 rubles, for her work on the development and introduction of new forms of therapy to prevent “graft-versus-host disease” (a secondary infection) among children with acute cases of leukemia and hereditary diseases after allogeneic bone marrow transplantation. 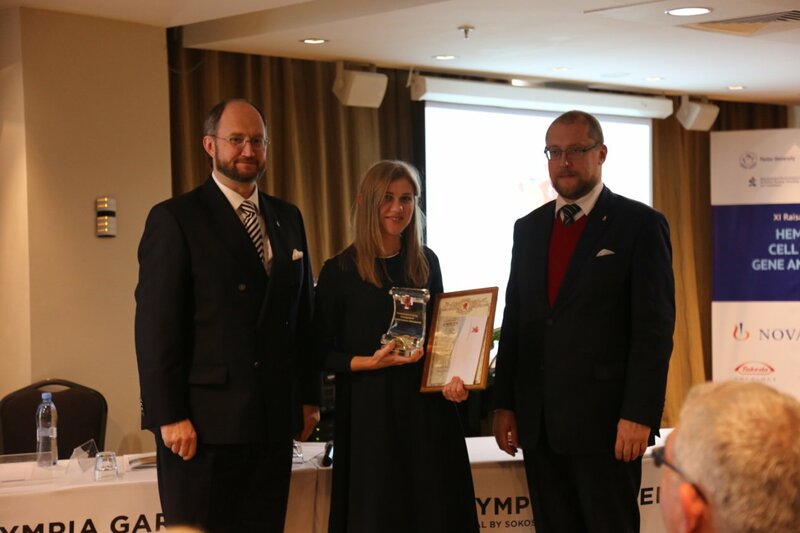 The Prize in the Second Class, along with 50,000 rubles, was awarded to Dr. Polina Valerievna Kozhokar for her research on the effectiveness of repeat allogeneic bone marrow transplantation among children with acute leukemia. 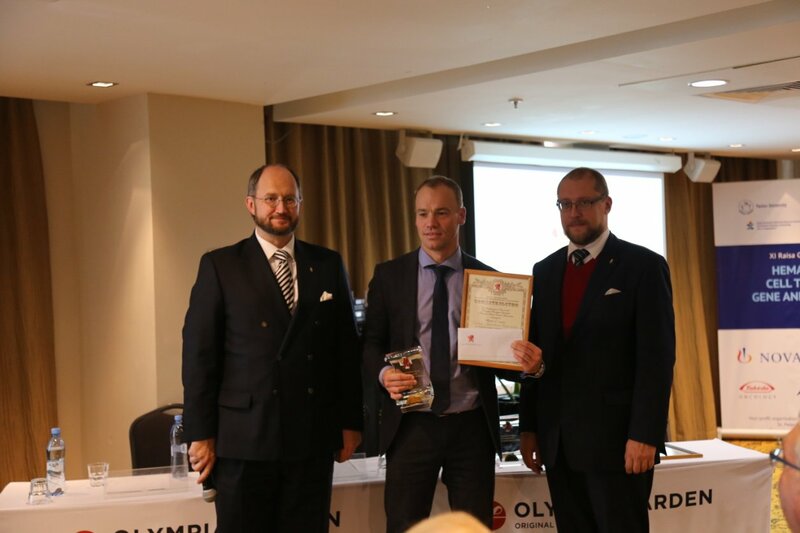 The Foundation’s Prize in the Third Class, along with 40,000 rubles, was awarded to Dr. Pavel Sergeevich Borisov for his work in the successful practical application of scientific advances in the diagnosis and treatment of oncological diseases. The General Director of the Imperial Cancer Research Foundation, Archpriest Alexander Tkachenko, described for all those attending the ceremony how the Foundation helps to support young medical researchers so that they in turn can treat as many people as possible. 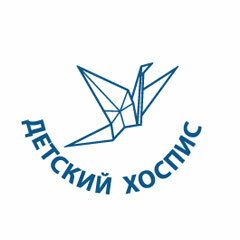 The Foundation continues to organize and participate in charitable programs that support the work of oncological research and treatment centers in various regions of Russia, as well as programs that encourage the exchange of knowledge and experiences of young doctors working in clinical residencies. After the ceremony, the Director of the Chancellery of the Head of the Imperial House of Russia, Alexander Zakatov, and the General Director of the Imperial Cancer Research Foundation, Archpriest Alexander Tkachenko, presented documents to Professor Ivan Alexandrovich Turabov, Chief Pediatric Oncologist in Archangelsk, certifying the donation of two bedside monitors to the Northern State Medical University. Professor Turabov had previously approached the Imperial Foundation with a request for assistance in acquiring several pieces of essential medical equipment. “We’re quite used to coping patiently with our own various medical needs, but the children who have come to us for care because of their serious condition—they can’t wait for a resolution to these problems,” Professor Turabov said. 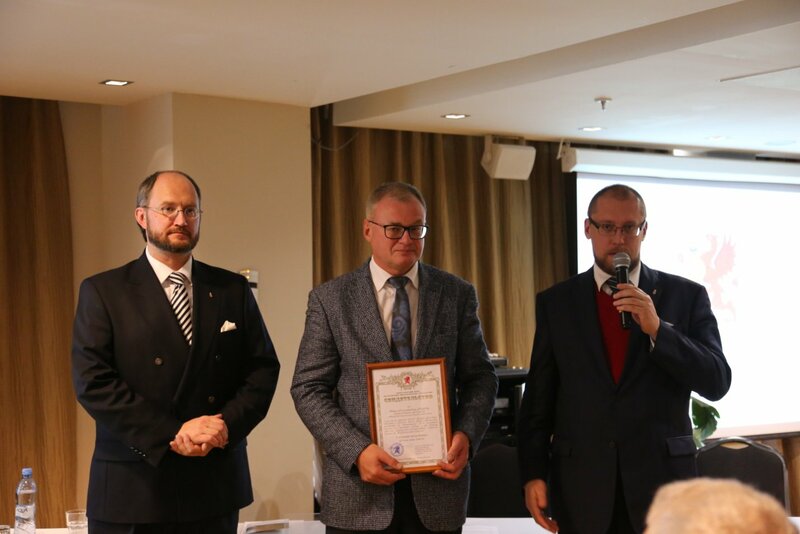 The Board of Experts of the Imperial Foundation saw the very clear and urgent need for the Foundation’s help, and immediately approved Professor Turabov’s request for assistance. 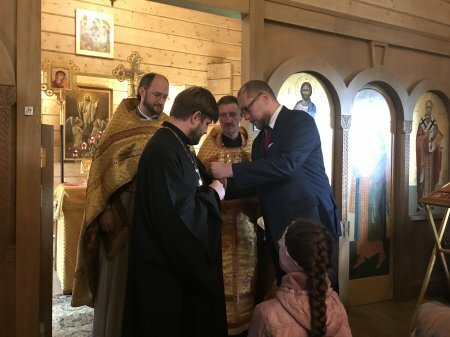 On Sunday, September 17, 2017, the Director of the Chancellery of the House of Romanoff attended the Divine Liturgy in the Church of St. Nicholas, a temporary wooden church constructed next to the construction site on Dolgoozernoi Street of the new Cathedral of the Descent of the Holy Spirit on the Apostles, in St. Petersburg. 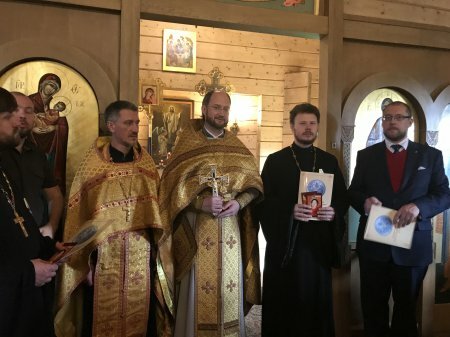 After the Liturgy, Alexander Zakatov conveyed to the clergy and faithful of the church the greetings of Grand Duchess Maria of Russia and of Tsesarevich George of Russia, and their thanks for the many prayers offered on their behalf. 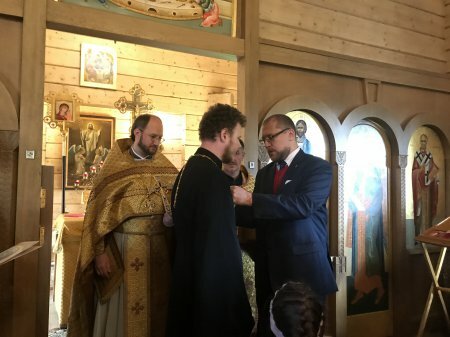 Alexander Zakatov also awarded the Imperial Commemorative Medal “Anniversary of the Nation’s Victory, 1613-2013” with the accompanying documentation to the clergy of the church, Fr. Konstantin Kuzmin and Fr. Evgenii Kamorkin, as well as to the choir director, Denis Rozov (whose 40th birthday it was that day). After the services, the Director of the Chancellery of the Imperial House of Russia, Alexander Zakatov, and the Chairman of the Committee for Philanthropy, Civic Education, and Social Responsibility of the Civic Chamber of the Russian Federation, Archpriest Alexander Tkachenko, held a brief ceremony honouring Liudmila Vladimirovna Krutikova-Abramova, the widow of the prominent Russian writer, F. A. Abramov. 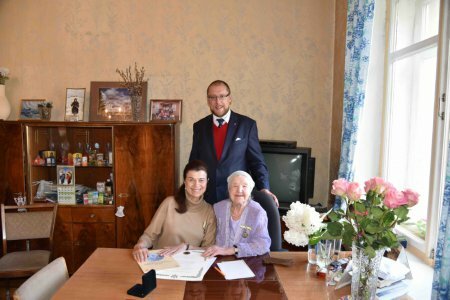 (On September 23, 2017, Liudmila Vladimirovna will celebrate her 97th birthday). 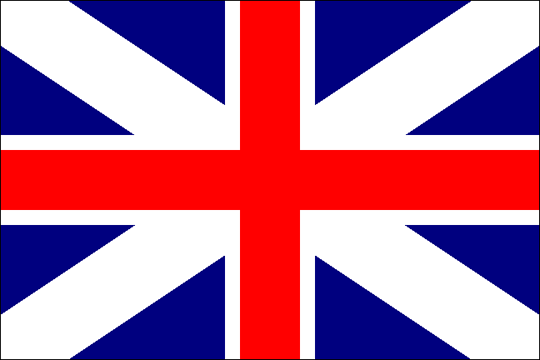 On instructions from the Head of the Imperial House of Russia, H.I.H. the Grand Duchess Maria of Russia, the Director of her Chancellery awarded Liudmila Vladimirovna Krutikova-Abramova the Imperial Order of St. Anastasia the Alleviatrix of Captives in recognition of her contributions to Russian culture and to the Russian Orthodox Church. 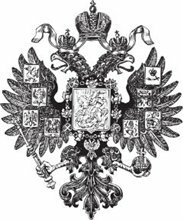 She was also presented with a Diploma with her Coat of Arms, which attests to the elevation of her family to the General Armorial of noble families of Russia. Taking part in this investiture ceremony were: Archimandrite Iosif (Volkov), the abbot of the Artemievo-Verkolsky Monastery; the philanthropists Tatiana Nikolaevna Biryukova, and Andrei Petrovich and Galina Ivanovna Rogalev; and the niece of F. A. Abramova, Galina Mikhailovna Abramova. Alexander Zakatov also presented the Imperial Commemorative Medal “Anniversary of the Nation’s Victory, 1613-2013” to Tatiana Nikolaevna Biryukova, who was nominated for this honour by Archimandrite Iosif in recognition of her fervent and significant assistance to the Artemievo-Verkolsky Monastery. Liudmila Vladimirovna Krutikova-Abramova expressed her heartfelt gratitude to Grand Duchess Maria of Russia for this honour, and gave a short speech about her husband, his work to help restore and revive the Artemievo-Verkolsky Monastery, her efforts to help preserve the literary legacy of Fedor Alexandrovich Abramov, and her plans for the future. 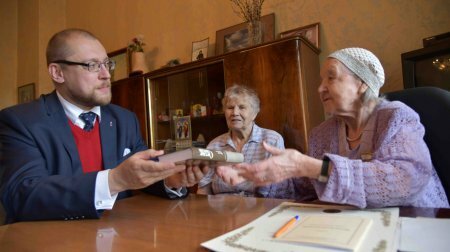 Liudmila Vladimirovna presented Alexander Zakatov a copy of a book she compiled of works by her husband, Fedor Alexandrovich Abramov, entitled Svetlye liudi, which includes a brief inscription. 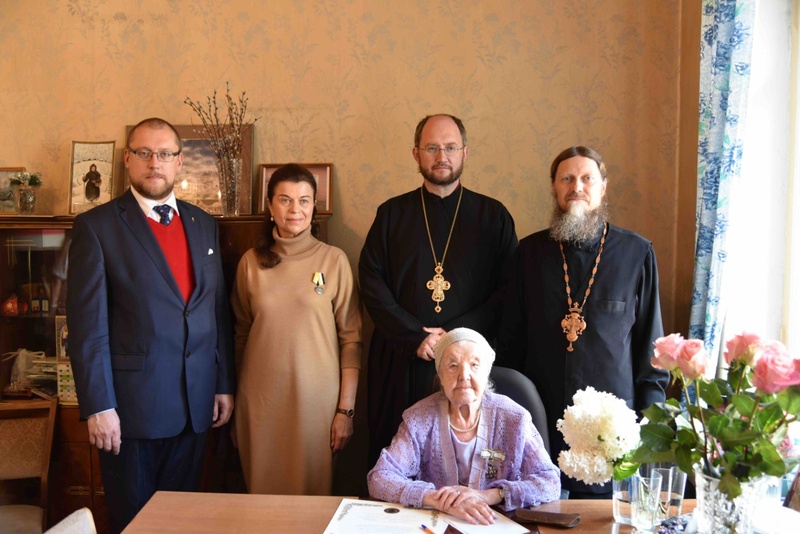 This working visit by the Director of the Chancellery of the House of Romanoff to St. Petersburg also included meetings with philanthropists and social workers and organizers collaborating or planning to collaborate with the Imperial Foundation for Cancer Research, and with clergy from the Cathedral of the Descent of the Holy Spirit on Dolgoozernoi Street.